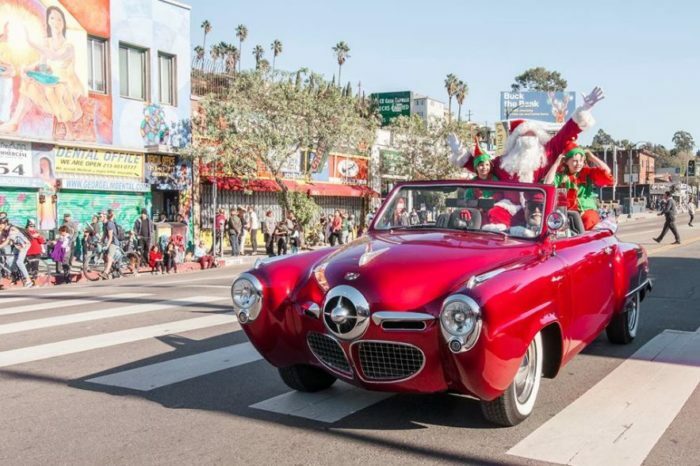 This weekend, from Friday, December 7 to Sunday, December 9, features 29rooms, Holiday Craft Party, Festival of Carols, Griffith Park Festival of Lights Hike, Venice Canals Holiday Boat Parade, The Disgusting Food Museum and MUCH more. Hope you find the rundown useful and, as always, enjoy your weekend! 2. Join Refinery29 in an immersive installation during 29rooms at The Reef (December 5-9). The event will feature 29 different interactive spaces created by artists both local and international. Experience include anonymous palm reading, sound bath, a blindfolded multi-sensory ASMR tunnel, live dance performances, and more. 3. The Echo Park Craft Fair returns to Mack Sennett Studios in Silver Lake on December 7-9 with over 120 curated artist, makers and food vendors. 7. Enjoy a special performance of The Nutcracker (Dec. 1 – 24.) by the American Contemporary Ballet on the 18th floor of California Plaza in downtown. After the show, guests are invited by The Fairy for a celebration with live music, champagne, and more. 9. Here and Now transforms it’s newly opened space into a holiday bar called Blitzen’s from November 28 through December 31. Get transported to the the North Pole and enjoy a snow machine, themed entertainment like Bad Santa and carolers, and seasonal food and drinks. 11. LA Auto Show returns with thousand cars on display. From Nov. 30 to Dec. 9 experience various car exhibits, model debuts and more at the LA Convention Center. 12. The Holiday Light Festival Train Ride at Griffith Park is a festive one mile ride on the tracks with tens of thousands of lights to get you in the Holiday spirit. Running daily Nov 23 through Dec. 23 and then again from December 26 to December 30. 14. Rooftop Cinema Club returns with holiday themed screenings at their Los Angeles venues at LEVEL in Downtown LA and Hollywood location, NeueHouse. The spaces will turn into a Winter Wonderland with holiday decorations, snow and festive food. This weekend they will screen Elf, Home Alone, The Holiday and more. 16. Since its the first Friday of the month check out all the cool events happening around town including block parties and art walks for First Fridays. 17. Get into the winter spirit when ICE at Santa Monica returns with a 8,000 square foot ice skating rink. Running November 3, 2018 through January 21, 2019. 19. The Walt Disney Concert Hall presents Festival of Carols a celebration of beloved holiday songs sung by the talented Los Angeles Master Chorale. Songs will include both traditional and contemporary arrangements. 21. This Saturday there’s a Holiday Craft Party happening at Crafted at the Port of Los Angeles. Workshops will range from $1 to $10 each. Guests will also enjoy shopping from vendors, artisanal snacks and beer from Brouwerij West. Admission into the party is free. 22. The Renegade Craft Fair returns to Los Angeles State Historic Park in Chinatown December 8-9 for a diverse showcase of some of indie craft and design artisans and makers plus DIY workshops, local food vendors, seasonal cocktails, DJ sets and more. 23. Smorgasburg takes over the Santa Monica Pier on Saturday for a holiday popup as part of the Santa Monica Pier’s Wonderland by the Water series. Admission is free. 24. Griffith Park Festival of Lights Hike 2018 takes you through Griffith Park with a collection of others holding holiday lights to create a glistening display of night wanderers! The event will see participants starting at the Merry Go Round Lot 2 and finishing at Dante’s Peak, with a brief stop at The Helipad at Griffith Park. 25. Westwood Village will host a festive family day featuring a free outdoor screening of the holiday classic Elf. The movie starts at sundown and other festivities include a visit from Santa Claus, holiday themed photo-booth, live music, kids crafts, and hot cocoa. 26. KROQ Almost Acoustic Christmas (Dec. 8-9) takes over The Fabulous Forum with a killer lineup that includes Smashing Pumpkins, Thirty Seconds to Mars, Death Cab for Cutie, Bastille, Greta Van Fleet, Bad Religion, Young the Giant and more. 28. On Saturday embark on a holiday pub crawl across Santa Monica’s best bars and restaurants. The event will allow participants to receive deals and specials at all participating locations. Attendees are encouraged to come dressed in holiday outfits and there will be a scavenger hunt with a grand prize at the end of the night. 29. Imagine a live show built around adults confronting the most embarrassing creative artifacts from their childhood… and then sharing those with a live audience. That’s the concept behind Mortified, an evening of entertainment where adults share embarrassing things they created as kids– diaries, love letters, lyrics, poems, home movies– with a group of total strangers. 31. Not your average holiday market, Bar Sinister’s Fifth Annual Holiday Shopping Bizarre is an alternative party where you can score unique and kind of dark creations while enjoying performances by the Sinister Go Go Girls and additional tantalizing performances in the Purgatory Pleasures Upstairs loft. 33. Sanctuary clothing will host a warehouse sale at their headquarters in Burbank with clothing starting at $10. This is the best time to stock up on coveted trend pieces as well as Christmas gifts. You’ll be shopping for a good cause as 20% of the proceeds will go to the California Fire Foundation in support of victims affected by the Woolsey Fire. 36. ban.do will host an epic holiday event called “the mall” on December 8-9 at their Hollywood Headquarters. The pop-up will feature tons of ban.do items on sale as well as other brands plus activations like manis from color camp, pretzels from Auntie Anne’s and more. 39. The Bai Holiday Ice Rink returns to Pershing Square from Nov. 15, 2018 to Jan. 21, 2019 daily featuring a 7200 square foot outdoor ice-skating experience. A wide variety of events will take place throughout the duration of the rink. 42. NextDayBetter is a Filipino focused culinary event bringing together tastemakers and game changers for food, libations and a fireside chat with Filipino chefs Alvin Cailan, Chase Valencia, Barb Batiste, Adrienne Borlongan and Johneric Concordia. The conversation will be moderated by Samantha Duenas a.k.a. SOSUPERSAM. 45. The folks behind the Museum of Failure presens The Disgusting Food Museum (Dec. 9, 2018 through Feb. 17, 2019.) Some of the ‘delicacies’ include maggot infested cheese, bull testicles, and sheep eyeballs. If you’re brave enough, visitors will also get to smell and taste some of the creations at the end of the exhibit over at a tasting bar. 49. The annual LA Kings Holiday Ice happening at L.A. LIVE’s Microsoft Square is a daily outdoors holiday skating rink. Open November 10, 2018 through January 6, 2019. 51. Head down to The Fairplex at Pomona for the Chinese Lantern Festival where the theme is “The Wild,” featuring animals represented in lanterns from five different areas of the world, Antartica, Asia, Oceania, Africa and America. Some of the larger pieces stand all the way up to 23 feet tall. The festival run every Thursday through Sunday from Nov. 15 – Jan. 16. 52 Artist Ken Salter brings his experiential installation Garden of Strange Loops: So Tonight that I Might See to Gallery 30 South in Pasadena this Saturday. The exclusive exhibit will allow guests to interact with a “Reflecting Pool” while sensors track the guests movements and transform them into one-of-a-kind psychedelic images in an instant. The exhibit runs until January 27, 2019. 53. The Foodie Space (Nov. 21- Dec. 30) is the latest interactive pop-up museum designed for serial foodie photo-taker’s. Located in Pasadena the museum claims to poke fun at society’s obsession with social media and #foodporn. Food-themed exhibits include a giant bowl of phở, glitter fries that you can marry and more. Happening Tuesdays through Sundays. 54. Step into a retro-inspired winter wonderland during Miracle at The Everly: Ever Bar happening at The Kimpton Everly Hotel. The Christmas-themed bar open now through December 31 features a candy cane “selfie station,” a 15-foot inflatable Santa Claus, and a dedicated Hanukkah Hut. This Friday, mark your calendars for the✨Sagittarius New Moon Night✨ @ Bar Franca hosted by @neonaltar 💎 with a DJ, mystic moments, aura photography, and much more! Featured here is Open Heart by @drinkyourview who will be behind the bar serving crystal-infused cocktails from 7pm – 10pm, see you there! December is the month of the Sagittarius new moon and Bar Franca in DTLA is going all out by hosting a spiritual night of cocktails, herbs, crystals, and aura photography on Friday, December 7 from 7 to 10 p.m. Guests can imbibe crystal-infused cocktails, partake in a tarot card reading by Harriet And The Star, or have their aura photographed by Jung Americans. Neon Altar will also be there with her curated selection of crystals and other products available for purchase.